You are not likely to visit Kuah only to dine. But you are likely to come to this capital town of Langkawi for several other reasons ... you may be arriving by boat at Kuah Jetty, you may have come for business reasons and staying in Kuah, you may be coming here to visit some of the top attractions of the island, etc etc. And then you will end up looking to find a nice dining option. This is exactly the reason why so many restaurants and eateries have come up in Kuah town. The population of both locals and tourists in the area have given rise to restaurants almost of all types including the international fast food outlets like Mc Donalds in Langkawi Fair Mall, KFC next to the Jetty Point and so on. Langkawi Fair mall itself has several other upscale and midrange restaurants. While Kuah does not compete for the top spot as a dining venue in the island, it does have several very nice restaurants, few of which in fact appear in our own list of favorites. An open air restaurant in Kuah serving great food (fish, crab, prawns, lobsters, clams, chicken, vegetable etc.) at very reasonable price. Pork and beef are not available. The ambience is casual and service is friendly. They also serve beer, fresh juices, tea, coffee etc. This is a budget eatery and a locals favorite. 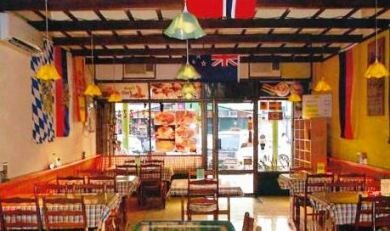 Come in the evening and you will see rows of chairs and tables lined up in the open and next to the road where locals indulge in sumptuous Malay fares like Nasi Ayam, Nasi Campur, Roto Canai and lot more. 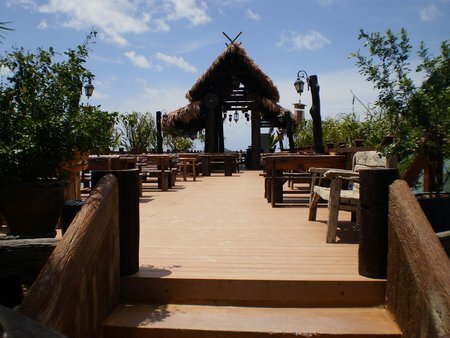 It's located at the back of the town, but a very popular place for late lunch and dinner. You can get dinner here until late at night. A cafe style eatery located at Langkawi Fair Mall in Kuah town with both outdoor and indoor air-conditioned seating. The Indian dishes are quite nice and served hot in earthen pots. Try out some of the great dishes like naans (breads made in Tandoor), daal makhani, paneer butter masala, lamb shish or chicken.... delicious. However note that the service may not be good always. You will find Nepali staff here speaking Hindi. It's and eat and go place, but clean and good. Open hours: 6:30am - 4pm, 5:30pm - 11:30pm. Ask a local or a yachter, he will tell you where this cafe is. It's on the road Jalan Persiaran Putra and a bit difficult to locate. Ask the taxi driver to take you to Amanda Coffee and Tea inside Pekan Rabu complex. The owner Amanda Zulkfli and her brother Fakris have put together what can be better described as an Art Cafe. While Amanda's keen interest of Coffee painting has its impressions all over the red walls of this cafe, Fakrir goes on to create the widest range of non-alcoholic beverages in the island including hot chocolates, soda syrups from France, ice blended drinks and of course coffee and tea. Try out the Banana Chocolate Freeze, it's awesome. The cafe also serves snacks like burgers, sandwiches, French fries and even light local items. It's open from 3pm onwards till late night. Located at the corner of a busy street (Jalan Pandak Mayah 5), this is a nice cozy restaurant & bar serving good food, coffee and beer. They make day's specials like ginger chicken or fish, or dorry fish sandwich that are really nice. 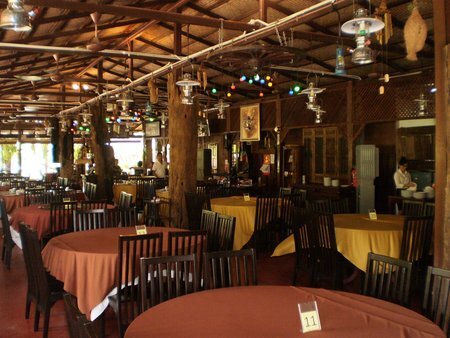 The menu is quite extensive and ranges from traditional Malay dishes to western cuisine. The restaurant has wide screen TV running sports channels and offers wi-fi (chargeable). It's open for lunch and dinner. Owner Dee personally takes care of the service along with his staff. Some of our favorite food here includes the Shepherd Pie with minced meat & served with mashed potato, the Fish n' Chips and even the Pizzas. They also serve nice burgers and several other Indian and Japanese dishes. Try out the fresh coffee, touted as one of the best in town. If you are looking for Hainanese chicken with rice, then look no further than Joe's Langkawi Hainanese Cafe, also known as Chicken Joe's. He has been specializing in this classic Singaporean dish which is prepared with poached chicken infused with ginger & garlic and served with rice prepared in chicken stock. You won't find a trace of oil. It just tastes delicious. Joe will prepare it himself, chop the chicken and serve it to you. 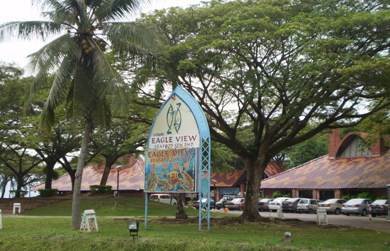 If you find this place early, I am sure you will keep going back before you leave Langkawi. We do it ourselves. It's spotlessly clean and the separate toilet is also very well maintained. Have a chicken broth soup, and Hainanese chicken with rice, wash it down with a beer, and it will be a scrumptious meal which you won't forget. 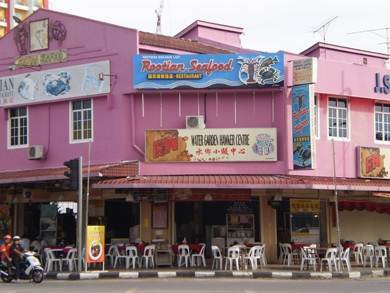 This is a fairly large restaurant located right next to Eagle Square in Kuah town. So if you are visiting Eagle Square, you can combine the visit with a nice lunch at this seafood restaurant. It's located right across the footbridge that goes over the narrow water body and next to Eagle Square. The restaurant is surrounded by lush greenery. Open Hours: 11:30am - 2:30pm, 6pm - 10pm. This is a nice Chinese restaurant and is located in the heart of the town center inside the Bayview Hotel. Compared to its location and setup, the dishes are priced moderately. The food is good and the service is quite friendly and prompt. It has a seating capacity of 200. It's open for lunch and dinner.